Attracting a potential customer is hard enough. Grabbing their interest and retaining them is even more difficult. It’s important to design your site so that user frustration is kept to a minimum, thereby maximizing customer retention. 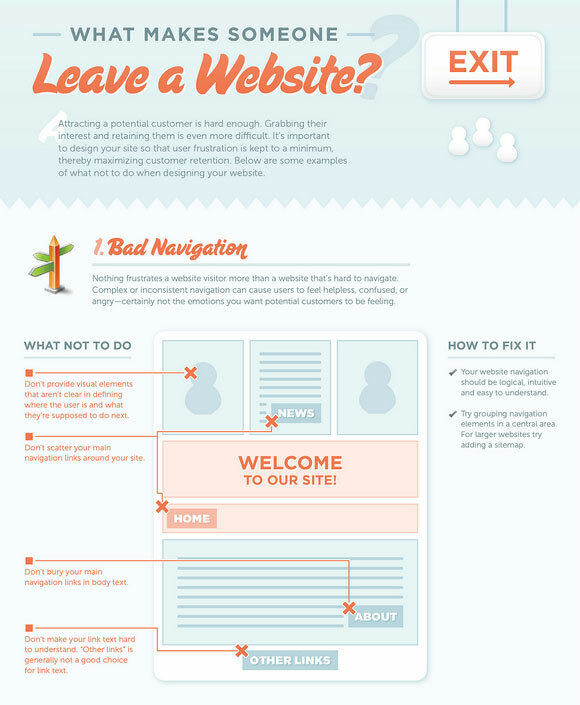 KISSmetrics has published an interesting infographic on “What Makes Someone Leave A Website“, is showing do’s and don’t’s when designing your next project. So if you are in process to design your website or new project, it’s definately a good resource for you. Let us know in comment area below how much do you like it. Was it any helpful or you already knew these techniques? Posted in Web Design & tagged Infographic. Use fonts that are easy to read — for all users. Give the text proper spacing. Make sure the text is scanable and that users can glean information from a quick look at the page. Use bullet points as needed. Stay away from lengthy pages, and break them into smaller pages for longer content. Understanding why people leave websites in general is very important for business owners. The following infographic does a great job of describing the problem and then provides you with proper tips to handle it. We hope you will find this information useful, enjoy! Great post. Keep writing such kind of information on your blog.